As I read this part of the story, I am fascinated by the interaction between David and Saul. One moment Saul is sending David out with the words “Go then, and the Lord be with you.” And the next moment he is trying to fit David with his armor and weapons for battle. Even though he didn’t think that the armor would protect him from Goliath, he thought David needed to go into battle fully armed. Here is an artists rendering of what that might have looked like. Or maybe this more modern picture more closely captures the image of the much bigger Saul trying to fit his armor onto the smaller David. I can just imagine David peeking out from under this huge helmet and saying, not wanting to offend the king: “I can’t wear this into battle because . . uh because . . I am not used to wearing armor when I fight giants.” The truth was, of course, that David knew he needed only what Paul would refer to as the full armor of God. In the meantime, Goliath, all 9’6” of him was in armor from head to toe. I suspect his helmet was close to as big as David. His sword and spear even larger than David. And his shield was so big he needed another person to carry it out front of him. So David goes out to meet him with no armor and no weapons except apparently his shepherd’s crook and sling. When Goliath saw him coming, he laughed at him, and roared, “You come to fight me with a stick. What do you think I am – a dog – that you can attack with sticks?” He didn’t even acknowledge the shepherd’s sling because by the time of this encounter, it wasn’t considered to be a serious weapon as it once had been. Rocks couldn’t penetrate shields and armor. David’s sling was mostly a toy. He used it for target practice in those long hours of watching the sheep graze. If he used it at all in his duties as a shepherd, it was probably more to get the attention of a wandering sheep, or startle the beasts that would prey on the sheep before he used the more serious weapons of rod and staff. David would later write in the 23rd Psalm that it was his rod and staff that comforted him when he came up against his enemies. The sling was not a serious weapon in a shepherd’s arsenal. In fact, the only mention of a sling in scripture is in this passage. So I got to wondering what a shepherd’s sling really was because I have always pictured what we call a sling shot when reading this story, so I went to Amazon.com and searched for a shepherd’s sling, and sure enough there were several to choose from. And I knew they were authentic because they all said they were made by David the Shepherd. So here is an authentic Shepherd’s Sling. So Samuel says that David refused Saul’s armor and weaponry and headed out to do battle against the heavily protected and armed giant, carrying only a staff. And Goliath laughs. “That’s the best you’ve got against me? A stick? Come on, let’s get this over with so I can scatter your body to be devoured by the birds and the beasts.” Even if Goliath saw David take his sling from his shepherd’s pouch and then reach into the stream and pick up some stones, he wasn’t threatened by it. It was no more than a toy in the hands of David. But in the hands of God it was so much more. All it took was one stone for God and David to triumph over Goliath, at least physically. Now here’s what I mean by that. When using a sling as a weapon, the stone itself is not the key. It’s the power behind the stone that makes all the difference. So let me suggest that the five stones speak more to the power behind David that enabled him to defeat the giant. Those stones were Davids armor. His weapons. As we look at the story as a whole, what is central is not the conflict between Goliath and the Israelites and David. While that is certainly important, it is not the central point that Samuel wants us to understand. Instead Samuel keeps drawing us back to the relationship between David and God. Where did David’s strength come from in the first place I think the stones represent the solid blocks upon which David’s relationship was built and so empower David when he goes up against Goliath. And that when placed in the context of the whole story, Samuel identifies what those stones represent. The LORD who rescued me from the paw of the lion and the paw of the bear will rescue me from the hand of this Philistine.” Saul said to David, “Go then, and the LORD be with you.” The first stone that slays the giants is the assurance that no matter what we face in this life the Lord will be with us always. The 23rd Psalm is all about the assurance of God’s presence no matter what we may face. Even though I walk through the darkest valleys, I will fear nothing because You are with me, David wrote. And then I think that the second stone that empowered David was prayer – his constant communication with God. Apparently David was quite the talker. He talked to anyone and everyone. In this story he talks to his brothers, and the soldiers in the army, and the king, whoever would listen. He talks so much, his brothers have had enough and try to shut him up. And David responds, “I can’t even talk.” In contrast to David, up to this point the Israelites have been silent in the face of the giant. Often times, when we are faced with giants we are silent. But not David. He will talk to whoever will listen, and most often that is God. Scripture tells us that David was a man who spoke to the very heart of God. He prayed without ceasing. The Psalms that David wrote were written as prayers and were used as prayers in the ancient church and often still are. It was his prayers that spoke to the intimacy of his relationship with God. When I was struggling 40 years ago with God’s call on my life, I talked with an older pastor about my struggle and he asked me if I had talked with God about it and I said, I am constantly talking with God about it. And then he said something I have never forgotten in all the times of struggle since then. He asked when you pray do you just talk at God, or do you take time to listen to Him. In all those days of being with the sheep in the fields David had learned to really pray. David refused to let the giant silence him when no one else would speak. The church of Jesus Christ is empowered to go after the giants by persons who are willing to live and give sacrificially. Give everything they have. Even lay down their life for their friends. David was able to defeat Goliath because He was willing to give everything he had in the battle. The church today faces a great many giants and if we are to triumph in this world, you and I must be ready to go after it with all that we have and all that we are. To live sacrificially. The third stone is the stone of sacrificial living. And then I think the fourth stone represents the servant heart of David. When you get home today, read this seventeenth chapter of 1 Samuel again and count the number of times servant appears in the story. It is clear that David’s only motivation in going up against Goliath is to serve God and to serve His people. He says to Saul that the reason that He will prevail is not because He desires fame and fortune and power for himself but because Goliath has taunted the people of God, and as His servant he can do nothing else but serve Him on behalf of the people of Israel. On behalf of the church. David does not go against Goliath for his own gain. He makes it very clear that He goes as God’s man. And if we are going to slay the giants that lay before us, we can not go in order to serve ourselves, but rather to serve God. We do not serve OUR church, we serve God’s church. And then the fifth stone is the stone of witness or testimony. Again and again, throughout this story, Samuel records David’s witness. First to his brothers and then to the soldiers and then to Saul, and finally to Goliath. David is clear that all of this has happened because of the faithfulness of God. All throughout the promised land the people had erected stone monuments at the places of great victory in order to testify to all who came after what had happened at that spot, so they would remember that their God had won this victory for them. Indeed when the people had first crossed the Jordan which God had parted for them, into the promised land, as the leaders of each tribe crossed, they had picked up a stone from the middle of the suddenly dry river bed and piled them on the other side of the Jordan in testimony of how God had led them into that promised land. David’s fifth stone I think, witnessed to the power of God which had toppled the giant at the hands of his servant David. For the sling to be a killing instrument, the stones had to be propelled with great power and might, more certainly than David the shepherd possessed. Only the power and strength of God can defeat the giants that we face. This church, made of stone, stands in this place as a testimony to the power of God that makes all of us who gather here giant slayers. Because when we stand before the people of God, to join the ranks of giant slayers, we acknowledge that on our own, with only the strength we possess we can not stand against the giants, but together, armed with the stones of prayer and presence and self sacrifice and a servants heart and a clear witness to the love and power of God, there are no giants we can not defeat. The giants will come. They will try block our path at every turn. They will taunt us. They will threaten us with defeat and death. And the question is: are we going to cower in fear? Are we going to turn back? Or will we take up our staff and pick up our five stones of prayer and presence and sacrificial giving and living and service and witness, as we Covenant to do when we become a part of the people of God, the church – and with God’s power and assurance defeat whatever giants that come our way. The decision is yours. 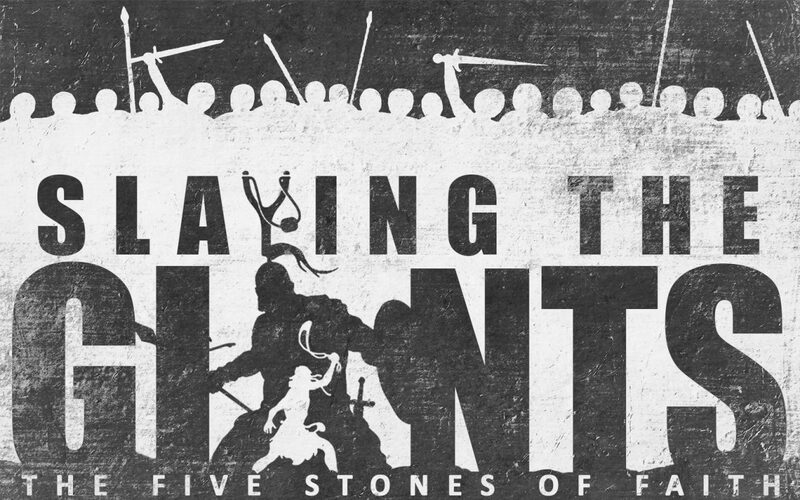 God is calling for giant slayers to step forward today and be His champion in this world of giants. And He wants each of us to stand in the line of David. But just as it was Davids choice, it is ours to make. God’s people need a champion. How are you going to respond?